I think there’s a difference between OODA as a planning tool and OODA as a “dogfighting” tool. 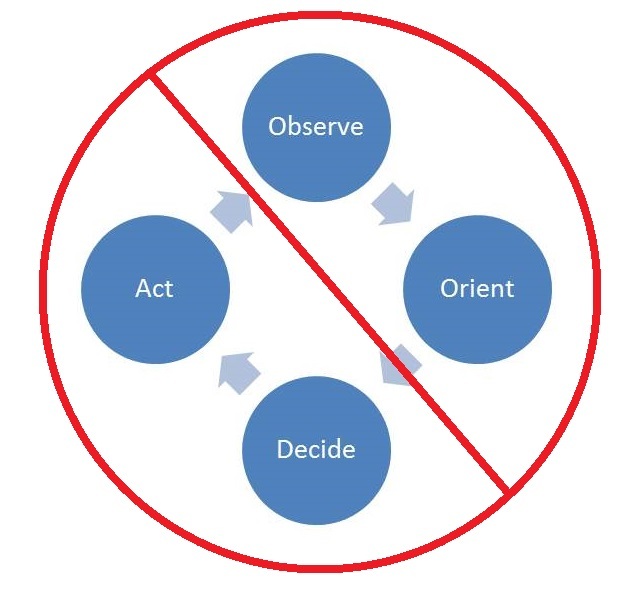 However…you do have to make training/equipment/process decisions before the dogfight to take advantage of OODA. Attacking the enemy from above with a more maneuverable aircraft that has better fields of view and tactics that took advantage of his strengths while avoiding the enemies gave Boyd an OODA advantage in battle. However, to consciously use OODA as a tool you have to make those equipment and tactical/training decisions before the conflict. That’s exactly what Boyd did with the Aerial Attack Study, which is still considered the manual for fighter combat decades after he wrote it. He laid out the various options, which aren’t as numerous as thought, and then laid out the decision process for choosing the correct Course of Action. The Course of Action chosen was largely based on positional relationships. “I’m the only one in this room professional enough, that I know of, to carry this Glock 40″ said DEA Agent Lee Paige, immediately before shooting himself in the leg because he neglected to ensure that his pistol was unloaded while conducting a demonstration at a school.